With all that has been going on I almost forgot that today is the 2nd anniversary of my blog. Those of you that know me know that I'm not in it for the money or fame! I'm in it for the interaction with other like minded women. I am so very happy to have 104 followers. When I first started I remember saying I would never have 30 women crazy enough to care about what I wore or how I felt. A lot of things have happened to me in the last year and really none of them were good. My stress level has been off the charts and my good nature has been challenged more than I care to admit. I just kept thinking one day at a time, and sure enough I am starting to see some light at the end of that elusive tunnel. I am thankful daily for my incredible husband that has taken care of me for the last 5 months and my family that has encouraged and supported me for the last year. I didn't take any pictures for my blogversary and to be honest I barely got dressed today. I've been very strict on myself through out my recovery to dress and put on make up everyday. Today it was cold, snowing and blowing and I caved to laziness and comfort. It actually is pretty liberating to have a day like this. I am currently rewarding myself with a glass of wine! (Hold on--had to take a victory slurp). I thought I'd make a little list of the top 10 things I have learned since I was accepted into the "Ya Ya Sisterhood" of blogging. This could get a little scary but you know my sense of humor! 1. How to wear a scarf and not look like I'm visiting a Muslim country. 2. Yes, I can wear a little navy eye shadow without looking like Tammy Faye Baker. 3. Use trends as an accessory not the main attraction. Life is not Pee Wee's Big Top. 4. We all have problems. Some are bigger than others but they shift around and hit us when we least expect it. When it's your turn "Eat, Pray and Love". When it's someone else's turn encourage them to do the same. 5. The joy of being exposed to the greatest group of women. They have encouraged me, laughed at, and with me. Consoled me and cheered me up on more occasions than I can remember. 6. Money is as money does. Purchase wisely on quality items. Whether it be retail or thrifting. Junk is junk. 7. FLATS ARE OK!!!!!!!!!!!!!! (I wear a size 10 if anybody wants to contribute to my sad little collection). 8. How to become a better writer. I'm a long way from where I started and I've got miles to walk in this cha-cha world but, at least I'm growing, learning and trying to teach myself a very valuable skill. 9. That we have a voice. We have decided not to fade off quietly into the night as we age. Those 20 somethings really do owe us a debt of gratitude. And, yes we have paved the way! 10. Most importantly! It's ok to be a fruit loop in a world of cheerios! Ladies, I didn't change my layout. Blogger did it and I don't like it! How do i fix it? Congrats on your anniversary! Not sure how to fix that layout. How about going into settings on blogger. I think there is a place there where you can change the layout. Congrats on your 2 year anniversary. And I love your list of 10! Congratulations! I love the older 50's bloggers that I follow, we DO have a voice. Keep it up and I'm so glad you've kept on truckin' through your ordeal. brave woman!! You're seeing the light at the end of a long tunnel and what a wonderful thing! How was it going back to work again? I've been avoiding changing my layout too even though blogger keeps putting things in my face to change it. I believe somewhere there's an option to "return to original blogger" but not sure where or how. If you type the question into your browser you should come up with a forum or discussion showing you how to change it back. Happy Blogoversary, Tammy, and may this year be MUCH better than the last. Just one personal recommendation before you try to fix it: save the current template before you do anything or your might lose all your blog set ups. Good luck! Loved ALL of your 10 lessons!! Fantastic! I can say AMEN to all of your 10 lessons!!! I've learned to let myself shine warts and all from the inspiration of bloggers like you!! 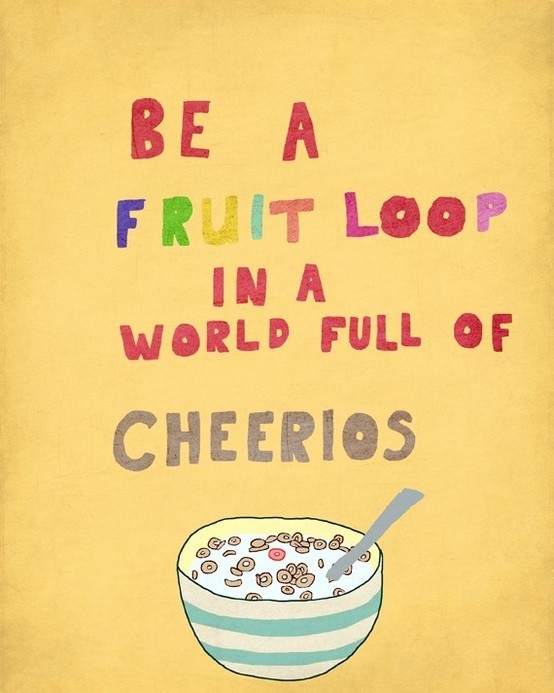 I'm the FROSTED FruitLoops in the bowl of boring beige Cheerios!! Happy 2nd anniversary, I hope to share many more with you, dear friend. Hahaha cracking up at #1, you rock the scarves Tammy! Happy 2 year blogaversary, you are one fiesty and fun loving Fruit Loop! :) And this 20 something year old thanks you for giving me and all us ladies a voice, you're a trail blazer! This is late for this post ... but belated Happy Blogaversary! I've been work and new technology crazy (unrelated to each other, actually) and I've missed a lot lately! I love each one of the ten ... YA YA!!!! Hope you are well and just busy. Take care of yourself, Tammy! Hope to see you on VM soon ... everyone misses you, I'm sure. I feel like I'm in good company. Your second anniversary is now my first anniversary for my new blog! I love your list...especially one, two and three! Congrats on two years and I, too, hope this year is a good one. Congrats! I completely forgot about my blogoversary. It is a reflective, sometimes navel-gazing exercise that reaps unexpected benefits, isn't it? Wishing you a good recovery!